Why settle for an average life when you can create a life full of even more happiness, success and fulfilment? 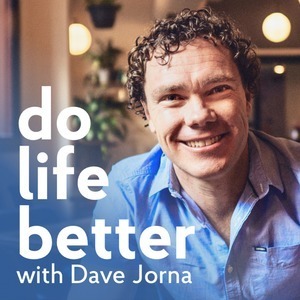 We found 10 episodes of Do Life Better Podcast with the tag “life”. What would it mean to you if you could live a fully vibrant life by being free from insecurity? Jaemin Frazer is an expert in the area of creating lasting change in people’s lives by removing doubt, fear and insecurity and will share with you the inspiration and wisdom you need to make positive change and help you show up at your best and bring your whole life to those around you in a loving way. In this half of the chat with Dr Jenny Brockis, she dives into the other two key areas of creating smarter, sharper thinking to help you live and operate at your peak every day. Make sure you've listened to the first half of the interview (episode #95) already to give the background to the tips and strategies you'll hear in this episode. Do you wish or hope for things to work out? It turns out that there is a big difference between the two. One is a form of a victim mentality and the other is a survivor mindset. During this Feel Good Friday, I’ll share with you the power and outcomes of being hopeful and how to increase your levels of hope. What would it be like if you could feel and operate at your peak every day? The good news is, you can easily achieve and maintain this level of energy, clarity and confidence with the right set of habits and routines. In this episode, Dr Jenny Brockis, author of Smarter Sharper Thinking, shares how you can create smarter, sharper thinking. It's time to be a help receiver. You probably spend so much time focusing on helping others, that you forget to let others help you. Maybe you don't ask for help because you don't want to be a burden, or because you like to do be independent and do it all yourself. Letting others help you is good for you and them. In this Feel Good Friday, I share the benefits of being a help receiver. If you have been wanting to make improvements in your life such as health, mindset, mental health, career, relationships, or anything else but aren’t making the gains you are hoping for, then a large part of that comes back to your self-awareness. Your self-awareness determines the success of your self-improvement. During this solo round, I'll share with you the habits and strategies to help you increase you self awareness so that you can gain greater improvements in your life and enhance your relationships and level of success. Happiness doesn't just happen. It's created from the choices you make and the habits you develop. In this Feel Good Friday, Cass Dunn, the host of the wildly popular Crappy to Happy podcast and author of the Crappy to Happy books, shares her 3 most important happiness habits. If you don’t sacrifice for what you want, then what you want becomes your sacrifice. And, to maintain the drive, persistence and strength you need to continue making these sacrifices, it’s important to have a cause and a meaning much bigger than yourself. Today’s guest, Andrew (Spud Fit) Taylor, became a viral sensation when the world heard the story of his personal challenge to eat only potatoes for the entire year in 2016 as a way to break his food addiction. His books, programs and coaching help thousands of food addicts deal with their own food psychology issues while losing weight and getting healthier along the way. The most important, influential, life-changing, mood affecting conversations you will ever have, are the ones you have with your self at each moment of every day. Ultimately, your self-talk creates the lens through which you see yourself and the world, and this lens changes everything. After all, it’s not what happens in your life that is important, instead, it's how you interpret what happens and how you respond that makes the difference. If you want to change your life, start by changing your internal dialogue. Even though I work hard at eating well, exercising and making enough time for rest, I still feel that I don’t have all these components dialled in well enough, because sometimes I feel too tired, foggy, or just flat and low on energy. And, it can be difficult to pinpoint the exact cause because there are so many different factors. So, chatting with today’s guest, Jason Gilbert was a big help for me. In fact, we started going into the specific things I should be doing each day to optimise my own health, clarity and energy, so I know this will be helpful for you too. Jason is a biohacker and is constantly researching the latest in health technology and new discoveries regarding the optimisation of human performance and wellbeing. He is also sports physician with the World Surfing League, owns of 7 Clinics in Peru and Brazil, is the author “O Segredo da Coluna Saudável” (The Secret of the Healthy Spine) in Portuguese and Spanish. English copy due 2018, a motivational Speaker, a TV Presenter FOX Life Brazil, a Health Coach, a Detoxification Specialist, and a Certified Yoga Teacher.